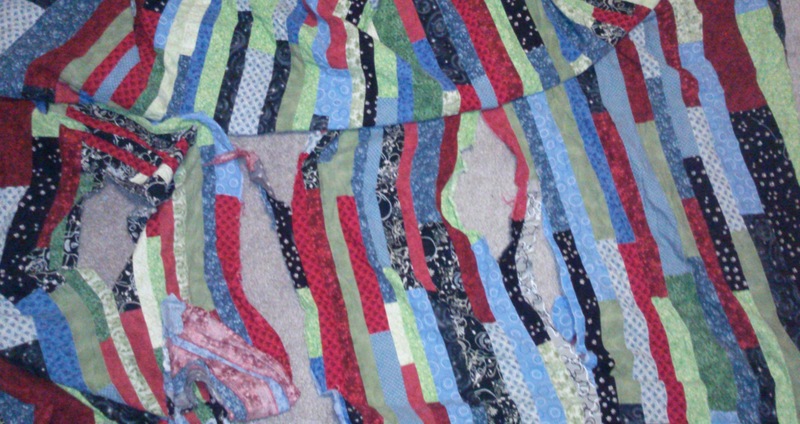 Bobby’s Quilt (quilt gone wrong)… amateur… hey we have to start somewhere, right? 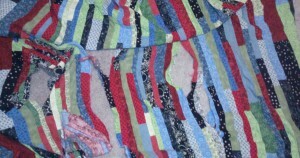 In the begining…before I knew how to quilt… there was some internet/ you tube videos…. not as many as there are now of course! There was fabric from the “J” word…. not any more of course! And there was also some prepackaged binding YIKES!!! I think that was the worst part. Ok so how bad could it be? 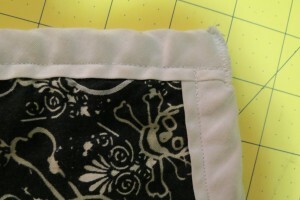 Oh I forgot to mention FMQ (Free Motion Quilting) not in my vocab. yet… oh, one more thing Quilting – would that be the act of quilting that keeps the quilt sandwich together? Not quite part of the vocab. yet either… Ok so let’s get to the pictures and I can tell more of the story later/below. Not too bad-looking, fun for a young boy, eh? 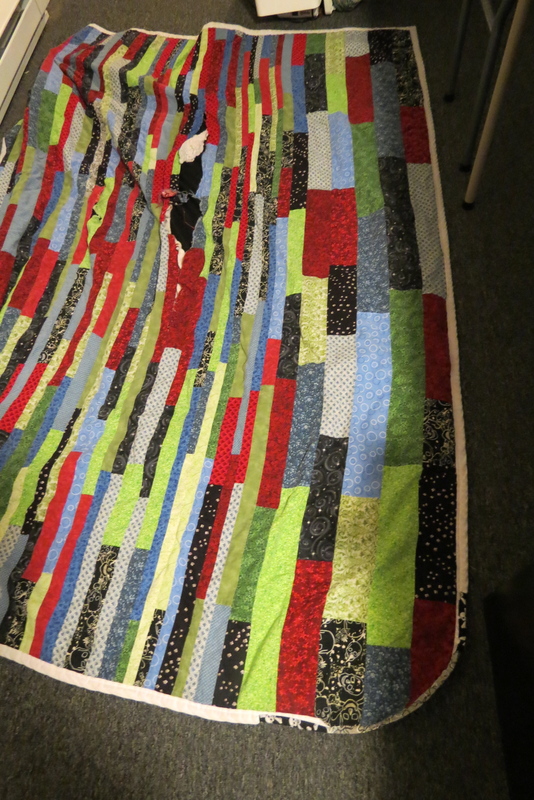 Ok, so you get the idea, great first project 1-5(+) inch strips all sewn together lengthwise down the quilt… 100+ x 100+”, mock pillowcase (mostly just mocking myself :)) oh you can see the nice white pre made binding on a young “boys” quilt (see where I am going with that). Ha, it’s all coming back to me… How about the king size bed sheet from the “W” for the backing!!!! LOL OMG I must have made ever amateur mistake on this one! So lets take us up to current day 2013-2014…ish…I got the whole thing torn apart this week. I threw away the wadded up batting, the dingy binding and the king size sheet (should have taken a picture of all that – what a sight! 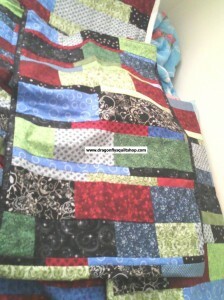 )…here we are just the quilt top, well at least whats left of it anyways! 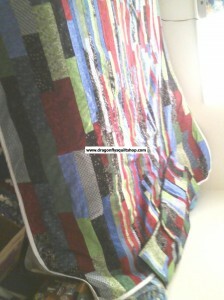 Remember 3+ years later, the boy is still missing his quilt… Now what? I am thinking 12″ or 14″ square blocks maybe cut diagonal across the strips, set on point even and maybe some funky sashing to tie it all together? Ha busting out the “quilting schooling” now 🙂 LOL… Subscribe below to follow this post to see what happens in 2014!!! !